How are pension withdrawals taxed? This guide is not personal advice. What you do with your pension is an important decision, which could be irreversible. Tax and pension rules can change and the value of any benefits will depend on individual circumstances. You should check you're making the right decision for your circumstances and that you understand your options and the risks. The government's free and impartial Pension Wise service can help you and we can offer you advice. 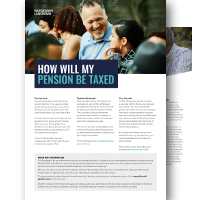 Most people can usually take up to 25% of their pension tax free. The rest of their withdrawals will be taxable.